Modern technology means that today’s politicians remain contactable, even when on holiday. Constant access to digital communications can be a mixed blessing but, in the event of a crisis, the public can rest assured that holidays can be interrupted and a return to Whitehall easily arranged, such as during the civil unrest in English cities in the summer of 2011. The situation was rather different in the middle of the 18th century, when the office of First Lord of the Treasury (as the Prime Minister is still officially known) was first becoming prominent. Communications were slower, with letters from London taking several days to reach Bath and around a week to reach Edinburgh. The balance of power between the King and his ministers was tilted in the monarch’s favour. The acid-tongued courtier and close friend of Sir Robert Walpole, John, Lord Hervey noted that George II had originally intended ‘to have all his ministers in the nature of clerks, not to give advice, but to receive orders’. 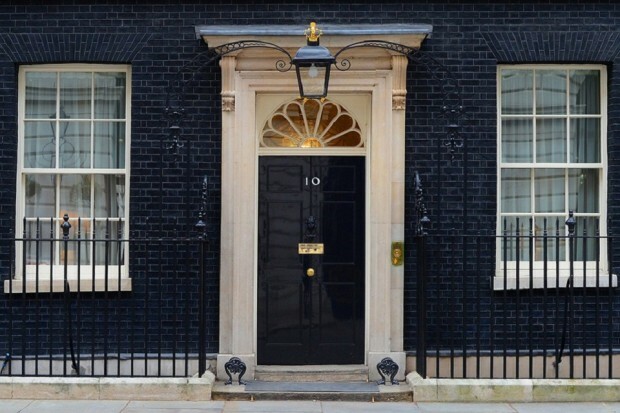 Number 10 Downing Street - the official residence of the First Lord of the Treasury. A tradition first established by Sir Robert Walpole during King George II's reign. One of the First Lord's primary tasks was to ensure that financial legislation passed safely through parliament. This involved gaining approval both for the budget and for the taxes needed to fund government expenditure. Much of this expenditure was spent on funding the army and navy and Britain’s diplomatic activity, with a smaller proportion funding the costs of state borrowing – a consistent feature of the financial landscape since the 1690s. Warfare was a persistent feature of national life. Between 1688 and 1815, Britain was at war nearly half the time – more than any other European power. Many of those who sat in Parliament were members of financial elites of various sorts – either the older elite that held landed wealth and dominated the Lords and the Commons, or those who had made money through trade and expanding mercantile activity. Although there were some who owed their place in the Commons to their position within the administration, for many politics was not a full-time occupation but pursued alongside, and often subordinate to, other interests. This was apparent in the timings of parliamentary sessions. Parliament sat from the late Autumn through to the Spring, with the Summer months left free for politicians to pursue their other interests. This frequently meant travelling back to estates outside the capital, so the townhouses in London’s fashionable and expanding West End were shut-up until the end of the parliamentary recess. While members of the Lords and Commons might have to travel considerable distances within Britain over the summer, the King often had even further to go. In 1714, the British thrones had been inherited by George I, the Elector of Hanover in the north-western corner of the Holy Roman Empire (now part of Germany). Born in 1660, George I had considerable political experience in, and an obvious affection for, the land of his birth and frequently returned to Hanover during the summer months. On occasion, the King was so anxious to get on the road that the parliamentary session had to be brought to a rapid conclusion (his presence was necessary for signing new legislation at the end of each session). George I spent five summers in Hanover and it was en route for a sixth visit that the King was taken ill, dying in his brother’s castle at Osnabrück in June 1727. As Prince of Wales, his successor, George II, had utilised his father’s summer absences to develop his own British credentials, entertaining political movers and shakers lavishly at Hampton Court. But on acceding to the throne, and regularly afterwards, George II also returned frequently to Hanover, making twelve trips between 1727 and 1760. Overall, the first two Georges were absent for roughly one-in-three summers between 1714 and 1760. Discontent at these royal absences was not hard to find. When George II was abroad in 1736, Lord Hervey noted that a paper had been posted in the Royal Exchange stating that ‘it is reported that his Hanoverian Majesty designs to visit his British dominions for three months in the spring’. The King claimed to be mystified by such complaints, commenting that his ministers went to their own country seats in the summer and Hanover was his. Yet popular unease was not the only problem that an itinerant monarch caused. How was the country to be governed effectively with the monarch away? This was a real problem because letters sent between Britain and Hanover could easily take a week to arrive. Meetings of ministers in London were timed to coincide with the days when post was expected from the continent. However, this was not really enough to ensure that politicians were kept fully informed of the King’s thinking on specific issues. Therefore the practice developed for one of the leading British ministers to accompany the King on his trips to Hanover and report back to colleagues in London. Given that most state activity in this period was in the sphere of foreign and military affairs, it made sense for the minister to have experience in these areas. This meant that it was usually one of the two Secretaries of State, rather than the First Lord, who travelled to Hanover. The Secretaries of State for the Northern and Southern department were the precursors of the Foreign Secretary, and divided responsibility for Britain’s international relations between them on a geographic basis. Holding one of these offices was not necessarily a guarantee of direct knowledge of the wider world. In 1748, Thomas Pelham-Holles, Duke of Newcastle (and later Prime Minister), accompanied George II to Hanover. This was his first trip to continental Europe, a mere twenty-four years after taking up the post of Secretary of State. The task facing the minister travelling with the King was a delicate one. On the one hand, he was in the best position to understand the thinking of his royal master but he also, increasingly, had a role to play in representing the views of those left behind in London. Within that group of ministers at home, there was a small inner core who acted as a sounding board for major decisions. They would frequently meet ahead of formal meetings of the Regency Council to fix the business. These meetings would take place in the Cockpit theatre in Whitehall or in the London residences of senior politicians like Newcastle, or Sir Robert Walpole. Membership of this group would typically include the other Secretary of State not with the King, the First Lord, the Lord Chancellor and other leading political and military figures. There were several consequences from this way of doing things. At the practical level, it was pressure from the ministers in London about the seriousness of the Jacobite rising in 1745 that forced George II to cut short his time in Hanover and return to London to take control of the crisis. Less tangibly, but perhaps more important in the long term was the sense of a concerted and independent ministerial voice that developed because of royal absence. George III (1760-1820) was not a traveller in the mode of his grandfather and great-grandfather. Ministers, who had grown used to expressing their views strongly and collectively due to the absences of George I and George II, now had to cope with an omnipresent monarch. They were keen not to give up the voice that they had acquired. One of the reasons why George Grenville and Lord Bute found it hard to maintain stable administrations in the 1760s was due to uncertainty about the balance of power between King and ministers. In the long term, the penchant of George I and II for holidaying in Hanover enhanced the power and responsibilities of both the Secretary of State and the emerging role of Prime Minister. Copyright Dr Andrew C Thompson. This article was produced as part of the No10 Guest Historian series, coordinated by History & Policy. Interesting,history seem to be sweep aside in our schools and its so important in the development of our society.